Alien film will escape from the vault. 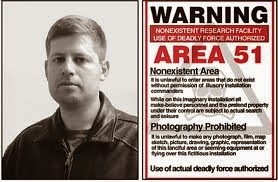 Shortly after Paranormal Activity exploded as a sleeper hit in Fall 2009, its director, Oren Peli, immediately began work on an alien-themed, found-footage companion piece titled Area 51. Though completed, the film never saw release for whatever reason, winding up locked away in the sort of secure facility reminiscent of the titular military base. After so much time on ice, it seemed like Area 51 would never see the light of day, yet a surprise announcement today has changed its fate. The film will now open in very limited release from Friday, May 15 through Sunday, May 17 only at select Alamo Drafthouse Cinema locations, and even then, only showing once per day. Fortunately, it will also be made available on VOD and digital platforms on May 15. Area 51, written and directed by Peli and produced by the horror-ubiquitous Jason Blum, is the story of a UFO-obsessed teen who convinces a couple of his friends to cut short their Vegas vacation to assist him in an ill-fated infiltration attempt on Area 51, where they wind up experiencing more extraterrestrial contact than they had expected. The movie stars Reid Warner, Jamel King, Ben Rovner and Jelena Nik. Discuss this story with fellow SJF fans on Facebook. On Twitter, follow us at @SandwichJohnFilms, and follow author Brandon Wolfe at @BrandonTheWolfe. TV Recap: #VIKINGS S03E10: "THE DEAD"
New #EXMACHINA Trailer. So Would You Trust Ava? TV Recap: #Vikings S03E09 "Breaking Point"
TV Recap: #TheFlash S01E18 "All-Star Team Up"
BALE, CARELL, GOSLING & PITT JOIN "THE BIG SHORT"